No matter where you stand, the simple mention of the word “homeschool” always seems to evoke a deep emotion. People love it or hate it, live by it or would never try it. At least that’s what I always thought. In fact, if someone would have told me I was going to homeschool my family, I would have laughed in their face (I think I actually did this) and told them they had lost their mind. Yet here I am… a homeschooling mama, living the homeschool life, joining homeschool communities, and collaborating with other homeschoolers. Who would have thought? Not Me! That’s why I’ve decided to tell my story and what better way to do that, than to start with you! You see, I don’t want to pretend to know everything there is to know about homeschool. I don’t want to pretend to tell you the best way to teach your children. I don’t even want to convince you that homeschool is the way to go. The truth is, I never wanted to homeschool, and most days I am not even sure I still do. What I do know, is that homeschooling is an adventure. Full of surprises, lessons both in life and in books, and it is full of challenges that both push you outside your comfort zone and stretch your thinking. I know that anytime I tell people we homeschool our children, we excite some pretty primal responses. We’ve heard positive encouragement such as “way to go” , “that’s awesome”, and “that is so incredible”. On the flip side, we’ve heard some of the most condescending remarks. One man actually told my children (a librarian, no less) that he felt sorry for them that I was homeschooling them. You see, everyone has an opinion and no one is afraid to voice that opinion and let it be known. Last night, I decided to ask my Facebook community to tell me the first thing they thought of when they heard the word “homeschool” and the results were amazing and eye opening. 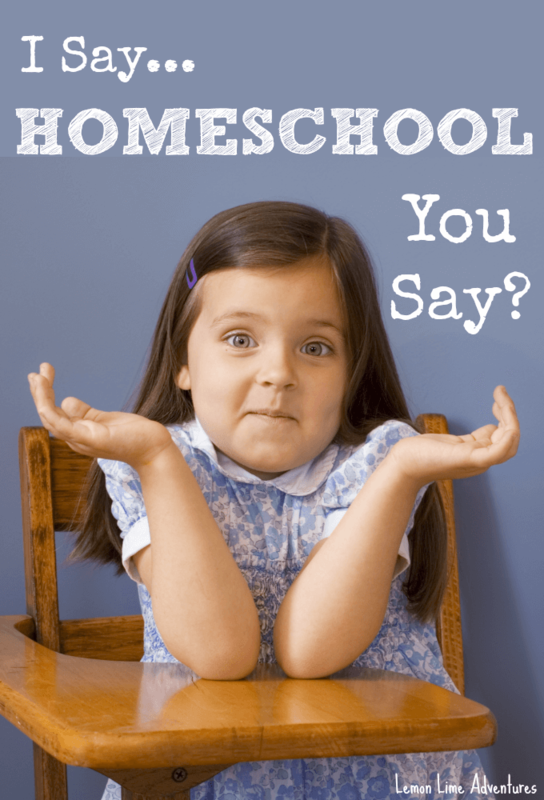 “I say Homeschool… you say….? ~ We love it!! I live in a city with tons of homeschoolers, so we have lots of support and numerous supplemental programs to choose from. ~ I did with four and ran a preschool program. Now kids are 31, 28,26 and 24. The only problem we encountered is some places do not accept a home school diploma. They are very few. We chose life skills as our main teaching. ~ You can do it and it will be the best decision you ever make. ~ Awesome! I plan to homeschool. None of this common core crap for my family! ~ The best education your child can get! ~ I was homeschooled 7,8 grade. Went to public school my freshman year then homeschooled again. Graduated a year early. I loved it! ~ Relaxing- We did several years of public preschool and it was like torture for my little guy. He enjoys school now and picks up on so much throughout the day without us even trying. ~ Just starting and can’t wait to dive in. ~ I wish I had the patience! ~ Whatever floats your boat. I have nothing against it, I’ve never really thought about it. ~ I say public school with plenty of intervention instead. ~ Unless you have a teaching degree that covers all areas of education, let schools do it. As moms we teach our kids all the time. But I don’t feel the majority of parents are qualified to help a student enter college. That and it shelters kids way too much. ~ I love the CONCEPT of homeschooling! But I know the reality is I am not organized enough. I am AFRAID that they wouldn’t get everything they need. That and I will admit that so far 2 of the 5 children do better spending the day away from me. They are challenged and can drive other people crazy with their wealth of useless information. ~ Hoping for a new fresh start to what I believe is going to be the best thing we have ever done! ~ If I have to I will, but I don’t know how you all do it! ~ CURIOUS Is it possible with me working full-time? If so, where to start? How to make sense of all the information found on the internet? Reputable people to seek advice from? ~ Just not the right timing yet. So Tell Me… What Do You REALLY Think of Homeschool? This year, I’ve decided to tell my story. The story of how I went from a hater, to an undecided and slowly am turning into a lover. It hasn’t been easy. It won’t always be easy but I think the story is important. I hope you will share your story with me and our community and follow along as I share ours. I would love to hear all about it! Connect with me on Facebook, Twitter, Google+, Pinterest, Instagram or subscribe by email so you don’t miss our next adventures! Whether you have chosen to homeschool because you absolutely love it, because you had to, or because its something you are just trying out, it can be an expensive journey. It doesn’t have to be, but it can be as you try new curriculum, fill your home with manipulatives, take field trips, or even just support your family while you stay home to teach them. That is why I have joined with over 30 other homeschool families to bring you a giveaway of $500 CASH! Yep. You read that right! One lucky winner will win $500 Paypal payment (you will need a paypal account to win)! All you have to do is comment below, telling me your thoughts on homeschool and enter in the form below. Enter once, enter twice… its completely up to you! There are so many opinions on homeschooling, and so many ways to do it. I think it’s interesting. This giveaway would be awesome for adding craft activities to the agenda…. or maybe some fun educational field trips! It would bless our family because we home-school overseas and have to pay outrageous shipping prices to get our curriculum here. WE base our school year on when our curriculum arrives. I would love to win this awesome gift because it would help me get some of the supplies I really really want to enhance our school time! LOTS of things to make an AWESOME felt board, crafty things, water beads and some organization supplies as well!! Thanks for putting on this give away!! Who couldn’t use an extra $500 for curriculum?? I would buy a microscope (I’ve been wanting one for my son, but they’re a bit pricey!) & a few other things. With both autism & cancer in our family, we have loads of expenses & money is very tight. We could definitely use it! Our family would be blessed to afford some music and fine arts lessons if we won this giveaway. Those extracurriculars for which there is never enough funds! I will be beginning my homeschool journey with my son. I have three adult daughters I homeschooled for some time when they were young. I saved very little and gave so much away. I am starting all over fresh. It would be a huge blessing to have some extra to get going! This money would definitely help support our homeschooling this year…I’m thinking, museums or a new tablet for the kids (the one we have is 3+ years old! lol). This giveaway would bless my family because I am going back to school this year for Graphic Design – money will be incredibly tight. $500 to use for books or curriculum would be awesome! This will be our first year homeschooling. My husband went from a “Nope, won’t even consider it…” to a a “Yes, let’s do this!” daddy after one year in public school for our daughter. I never thought we would attempt to homeschool, but we started home preschool last week and taking it one month at a time. This giveaway would bless our family by allowing us to buy materials needed and a membership to the zoo or aquarium for experience learning. Honestly, I did not choose to homeschool. I do not like the stressed I get with it. but I love to see my kids showing fruits. I keep telling myself one more year. I has been 6 years so far. I am getting ready to start our year. I do not like the stressed I get with it. but I love to see my kids showing fruits. I keep telling myself one more year. I has been 6 years so far. I am getting ready to start our year. This giveaway would allow us to buy some really awesome science supplies, which is my son’s favorite subject to learn about! What an impressive Giveaway!! Great idea of teaming up with other bloggers! It never occurred to me to homeschool, but then my oldest was reading at 4. I was supporting her anyway, and dreading sending her to full-day K, so it seemed like a natural next step. Hubby wasn’t thrilled at first, but agreed to a trial. Everyone is happy (most of the time) now! I would use the money for music lessons/equipment. There has been interest in violin around here. Field trip money!! And maybe a few books. We have twice attempted to place our oldest in public school, in two different states no less, and both times we’ve pulled her out to homeschool. Unhappy with the one size fits all approach and I’m finally ready to embrace this homeschooling “thing.” I’m nervous but also really excited! $500 would be a great boost to getting us organized and off and running. Looking forward to hearing your story. I wish there was less of a divide between homeschool and public school. Resources can be expensive this sure would come in handy. We will be doing a part-time preschool homeschool/unschool this year. After having seen home schooling done poorly and done wonderfully, I kept my mind open with our kids. Great public schools here, couldn’t afford Christian:(… in third grade our daughter began coming home off the bus in tears. The stress of learning was too much, and our journey began into special education. Now she is entering her junior year in high school, and even with an IEP, I know I can educate/accommodate her better than the school. She will go for extracurricular activities, and I will provide her core classes and life skills. It has been intimidating, exciting, overwhelming and in my gut the absolute right thing to do. She has been asking to be home schooled since she was freshman. The two of us will be on this journey together, trusting God, knowing everything will turn out the way it is supposed to. I used to teach public high school, then I swore I would never homeschool. And now we do and I love it! I would love to have more money to spend on random school supplies and more field trips! Best thing we ever did was to homeschool our kids. Winning would be a huge blessing. We would use it on field trips. Thanks for a chance to win ballet for the five year old and soccer for the teen! I would use it for field trip, extra-curricular activities, and many books!! I was a public school teacher for over a decade before having my first child. I never thought I would homeschool. I had lots of homeschooling friends that would say, “Have you ever thought about homeschooling? ” I just laughed. It was fine if they wanted to do it, but it wasn’t for our family. Well, now, we are a month into homeschooling our first. Ha! 🙂 The money would be very helpful in purchasing supplies, science experiments, and supplementing the curriculum we have already purchased. We are just beginning homeschool this year, so far we love it! We love being able to wake up whenever we want to start school ( we aren’t morning people lol) I love that I have time to teach my children more about Jesus, and they love learning! My son is a first grader this year, I also have a 3 year old (thats way ahead as for as her knowledge, but wont sit still long enough for me to teach her to write or draw yet lol) and a 1 year old! I spent all summer preparing to start and buying supplies. We are excited to see where it takes us! I was one that said “I would never” I started with my second oldest, then my oldest. Now on 4th year in I’m homeschooling all 5 this year for the first time. Curriculum is expensive, My husband lost his job in May, this would definitely help. Living book, living books, and more living books! We could finish buying up all our reading books and supplies we will use in kinder! I grew up with one homeschooled friend. I thought it was really werid. I always wanted to teach, to contribute the things I loved to others who wanted or had to learn them. I loved public school and enjoyed every bit of it. I wasn’t socially awkward or popular, I just fit in wherever. I planned on going to college and getting a teaching degree, well I hated college. I went one year and wanted to be done. The following fall I met my husband and fast forward we have three kids. Without going into too much history our 8yr old would come home last yr being more interested in social happenings than with any learning, she was discouraged because others were progressing faster than she was, and I felt sympathetic to the point I was upset as well because she was more concerned with how far behind she felt she was than the progress she was making. Her sister has had medical problems which have contributed to social and sensory problems, I would come pick her up from school and before we drove away she would have what we call a melt down. She would be over stimulated so much in her over filled class that she would unleash it on the way home. Mornings were difficult too, waking her and rushing her out the door. I never thought my daughters had bad teachers but because we had different expectations than the school I just didn’t want to fight it. I’ve always wanted to teach, I coached in the middle school, I’ve subbed as well, I just wasn’t happy with the product of what was being taught, how things were handled and I especially don’t want that for my kids. I’ve decided to home school his year, I’m excited about it….I’ve also been told that the schools are so full now that they’ve had to turn those out of the school boundaries away. There is no money in the budget to hire more teachers….I’m sure I could go on and on but for now homeschool is for us, right now I will be encouraged. If I win, part of this money will go toward a little girl in El Salvador that I am now sponsoring through a Christian organization to provide education, food, and clothing. The rest I’ll use on items for my kids’ bedroom: desk chair and wall hangers for clothes/hats. If I win this money will go towards a trip to Nicaragua where we adopted our son from. I too avoided homeschooling like the plague. I wasn’t against it for others but didn’t think I wanted to ever do it. I was a high school and middle school science teacher prior to having kids. When my kids reached school age we shopped around public and private schools for both of my kids and found that no school in the area could meet their needs and help them work to their potential. My choices were put them in school and spend a lot of my time intervening or just do it myself. I thought my time was better spent to do it myself. After 7 years it has proven to be true. We have always taken homeschooling year by year and feel that this may be our last year. Their needs have changed and now it is time to find once again a more suited environment to meet those needs so that they can be all they were meant to be. Meeting the needs of the child to help them reach their potential needs to come first and parents should work as hard as they can and do whatever they can to make that happen. No one should judge any choice of education if helping to get the child to their potential is the heart behind the parent’s decision.